New to Ôoku? Start here. Introduction to this arc here. Major spoilers for the Iemitsu (vol 2-4) and Tsunayoshi arcs (vol. 4-6), including the drama and the Ôoku: Eien film. Warnings: the plot of this story arc contains sexual assault and abuse, dubious consent, murder, the death of a child, and back-stabbing, and is generally NSFW. 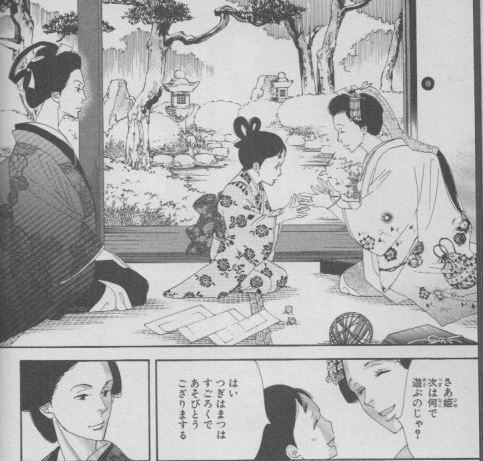 Tsunayoshi plays a game with her daughter Matsu-hime. Vol. 5, p. 16. Introduction here. 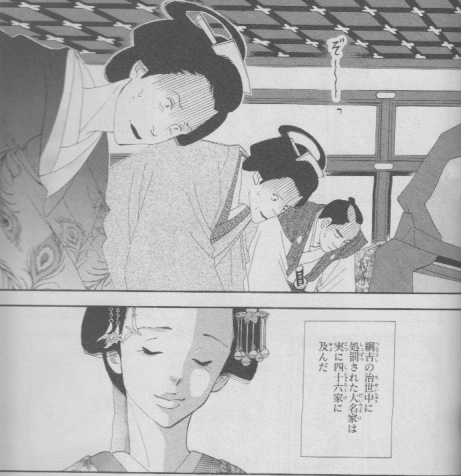 Spoilers for the Iemitsu (vol 2-4) and Tsunayoshi arcs (vol. 4-6), including the drama and the Ôoku: Eien film. Warnings: the plot of this story arc contains sexual assault and abuse, dubious consent, suicide, murder, and all the back-stabbing. I’ve kept the mostly images PG-13 (there’s a little gore in one) but the content is not safe for work. “I’m not like the former Shogun, who agreed to anything.” Vol. 183. I usually focus on Japanese media on this blog, but I did a guest post over on Comparative Geeks today about queer American comic anthologies. Enjoy! Guest post by Leah of The Lobster Dance, a blog about Japan, gender, media, and culture (with a heavy dose of manga and geekery) and I’ll Make It Myself!, a food blog. This piece also appeared in Feministe on 1 April 2013. As someone with a deep love of art, I was alarmed as Valentine was. I do not believe in the destruction of art, but what the stand-in for Mary Richardson said stuck with me. Consider the status of women in the art world: often considered the “muse,” rarely the artist; lauded as the pinnacle of beauty but having no worth otherwise: the Venus forever looking in her mirror, the object of the (male) gaze, not the subject of her own agency. Should a gallery or museum try to strive for the inclusion of women artists (and artists of color, queer artists, and so on), there may be criticism of ignoring the masters, so-called “female privilege,” and the desire for a gender-blind meritocracy that simply does not exist at present. If you were wondering what such an article might look like, look no further than C.B. Liddell’s “The diverse works of Asian women artists,” a special to The Japan Times.